If you are moving to a new home or you have decided to do some remodeling, you might be a little bit indecisive about the type of kitchen you want. Should you opt for fully fitted or bespoke handmade kitchens? Since there are several major kitchen types and layouts, I would like to present each of them, with their main characteristics, pros and cons and the costs. Hopefully, it will help you make the best choice when choosing the new kitchen for your home. A fully fitted kitchen – This kitchen makes the best use of space; working and storage areas are maximized. Depending on a budget, a fully fitted kitchen can be fitted by the customer or supplier, but it can also be supplied in a flat pack or rigid option. Previously assembled units come in numerous sizes and shapes and there are amazing corner solutions too. If you opt for a quality fitted kitchen, your home will definitely be enhanced. Nevertheless, this is the type of kitchen you cannot take with you if you decide to move somewhere else. A freestanding kitchen – Also known as non-fitted kitchens, freestanding kitchens have become increasingly popular because of their informal, casual and de-structured appearance. A non-fitted kitchen consists of individual pieces of furniture designed for certain tasks. Although it doesn’t make such good use of storage space, if you have enough space it might work for you. On the positive side, freestanding kitchens can be moved and used wherever you want. Rigid kitchen furniture – Factory built in kitchens can be dry assembled or the method of their construction can be a traditional “glue and dowel” type. Basically, these kitchens come in a wide range of cabinets choices meaning that they allow substantial design flexibility. A built in kitchen carcasses are be quicker to fit, because they arrive fully assembled. Nevertheless, the installation process is not as easy and these items can take up a lot of space. Commonly, rigid kitchen carcasses are manufactured using MDF and chipboard panels. Self-assembly or flat pack kitchen furniture – This type of furniture has been developed in order to speed up the supply process, lower the prices, as well as to satisfy people who like do-it-yourself projects. Although flat pack furniture is rather rare in European countries, it’s more popular in the United Kingdom. When it comes to the cabinets, the choice of sizes is still a little bit limited, even though there are significant positive changes in the range of available products. Similar to rigid kitchen furniture, flat pack or self-assembly carcasses are primarily manufactured using MDF and chipboard panels. A bespoke kitchen – This type of kitchen allows people to have the ultimate kitchen designed especially for them. Some manufacturers use the term bespoke kitchens for the kitchens that aren’t unique in design, but that do offer a wide range of materials, colors and shapes. There is, however, a difference between the kitchen that is designed and made using a range of cabinets with fixed dimensions but tailored to fit your home and a fully bespoke kitchen. The latter means that even the most unusually shaped rooms, windows and corners can be overcome. Nonetheless, for a truly bespoke kitchen you need to pay a lot more and installation process takes more time compared to all other kitchen types. One-wall Kitchens – Typical for smaller homes, one-wall kitchens work by keeping every appliance, ingredient and cooking tool easy to reach. In studio apartments or similar smaller, open spaces, one-wall kitchens are sometimes hidden behind pocket or sliding doors in order to make visual clutter minimized. Since the sink, refrigerator and range need a fair amount of counter space, it can be challenging to find enough work room to prepare foods, especially if there are two (or more) people cooking at the same time. If you have a really tiny one-wall kitchen, you might use a movable island or the dining table as an additional work space. Indeed, a built-in cabinetry island and a one-wall kitchen have become rather popular layout even in not so small homes with open floor plans. Galley Kitchens – Probably the most efficient kitchen layout, the galley kitchen is the perfect for cooking. If it’s necessary, the galley kitchen can make use of a cramped, small space to feed many people. In fact, many commercial kitchens are actually designed this way; cooks work in a narrow, long space between counter space and appliances. Although it is great for a commercial kitchen, the galley kitchens have some drawbacks in homes. This layout doesn’t leave enough room for a dining area and the interaction between a cook and other family members or guests is rather limited. U-shaped Kitchens – This layout is great for one primary cook. Essentially, it’s a galley kitchen with one closed-off end; it remains open to other rooms and allows traffic to pass, while keeping onlookers out of the basic work area. Issues associated with traditional kitchens with this layout are connected to its small size; sometimes, it is even impossible to fit the dishwasher next to the sink. There is also a seating issue, which can be addressed by a pass-through to the dining area on one of the “legs” of the letter U. 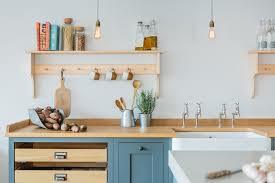 Also, you can eliminate the wall and the upper cabinets of that leg to turn it into a peninsula; although this methods means less storage space, the peninsula counter could be used for eating. If you move the refrigerator out of the main U shape gives more cookware and food storage near the ovens and range-top. U-shape and Island – If you want to increase the kitchen’s functionality, just add an island to it. Not only is u-shaped kitchen more functional with an island, but it’s also more interactive; it allows cook to have a conversation and overlook family activities while preparing food. Also, if there’s a second cook, with an island, it’s easier to prepare meals and clean up together. G-shaped Kitchens – In fact, this layout is something like an improved version of the u-shaped kitchen. It is one of the best solutions for people who don’t have room to install an island. Typically, one leg is a peninsula, since having upper cabinets and a wall almost closes off the kitchen from the rest of the house. Nevertheless, this peninsula shouldn’t be too long, because in that case getting in and out of the kitchen can get to difficult. On the other hand, it shouldn’t be to short; ideally, there should be enough room for a few guests to be seated. L- shaped Kitchens – L-shaped kitchens and open floor plans have become increasingly popular because more and more people have ditched the formal dining room. L-shaped layout, in general, consist of two perpendicular, adjacent walls. These kitchens range in size from really large to tiny ones and that depends on the length of their “legs”. This layout is perfect for cooks who like to entertain and invite guests into their cooking area to mingle and have conversations during a cocktail party or a casual dinner. Nevertheless, if an island is not incorporated, the cooks will still be facing away from the family or party activities while preparing meals. L-shape and Island – If you want maximum flexibility in hanging out, entertaining and cooking, the L-shaped handmade kitchen and and island is the layout you should choose. Now, you are ready to choose the type and the layout of your new, beautiful and functional kitchen! Have fun and good luck!